Donnie Trumpet is a young, up and coming musician from Chicago, Illinois. He is well-known as a producer in hip-hop, but, as his name would suggest, he is also an amazing trumpet player. Trumpet describes his instrument as his “voice”, and uses it in the same way a rapper uses his vocals. The Social Experiment is a hip-hop collective of different musicians. The lineup is never the same, and is interchangeable at all times. The song “Sunday Candy” is off Trumpet’s debut album Surf, and features Chance The Rapper on lead vocals. Several of the back-up dancers in the video wear chucks. The song is infused with a mish mash of different genres, including jazz, gospel, Caribbean, and hip-hop music. The hook is sung by Jamila Woods, and her vocals are soulful but contain an angelic clarity that really brings the chorus to another level. Chance brings such emotion to his verses as he raps an ode to his grandma, and how she has connected him to church. He mixes a soulful, gospel-like delivery, with his energetic rapping and creates something all his own. The lyric “Praying with her hands tied, President on my fan club...” is especially poignant as Chance, Donnie, and The Social Experiment performed this song in front of President Obama at the White House National Christmas Tree Lighting Ceremony in 2016. Chance and The Social Experiment in some sweet letterman jackets. 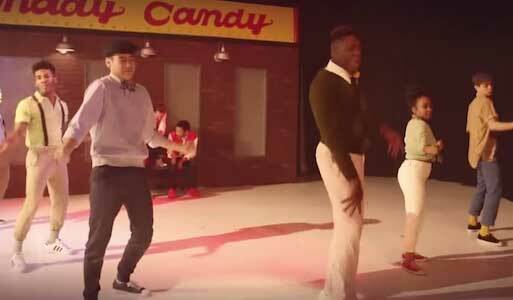 The music video was released in 2015, and features Chance, Jamila, Donnie, and The Social Experiment dancing in a mock 1950’s soda shop. 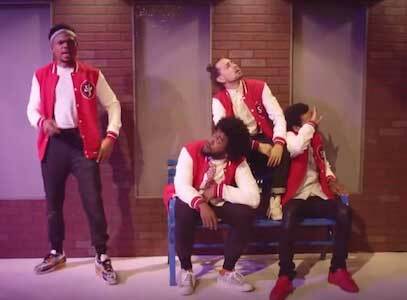 The choreography in this video is outstanding, as Chance, The Social Experiment, and back-up dancers pop and lock with the beat in precise rhythm. Since it’s supposed to give that old school 1950’s aesthetic, we see several people wearing chucks in the video including Jamila Woods, and a few of the members of The Social Experiment. Combining this song with this video is a sure fire way to put a smile on anyone’s face, as the energy and joy here are infectious. Get yourself a new pair of chucks to dance in by clicking on the links below.